High Stability and Safety electric car jack,constructed with heavy duty cold-rolled steel sheets,with large base and saddle,makes it strong and stable to lift your car.With 3Tons large load capacity,it can lift the car/SUV in less than a minute,12.5cm to 36cm lifting height for car and 17 to 42cm lifting height for SUV.Remove the screws by the electric wrench included in the package,change a tire quickly.You can plug it into car 12 volt power outlet or on your battery directly,push the controller button with long enough line,and the car/SUV goes up, just that simple to use.Comes with controller, crank handle, impact wrench, screwdriver, fuses, a pair of gloves, etc for much convenience.Packaged in plastic storage case for easy transportation and storage. Compact size equipment stores in car for emergent roadside tire change and repair. Lifting range: Approx. 12.5-36cm / 4.9" x 14.17"
Approx. 17-42cm / 6.7" x 16.5"
Jack size: Approx. 39.5 x 16cm / 15.6"x 6.3"
Impact wrench length: Approx. 8.66"
Screwdriver length: Approx. 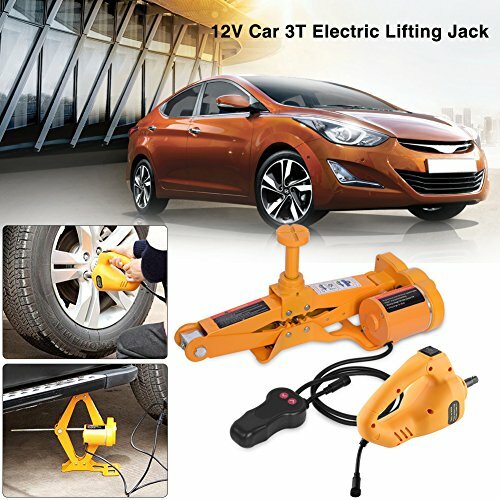 19.5cm / 7.68"
【High Stability and Safety】Our electric car jack is constructed with heavy duty cold-rolled steel sheets,large base and saddle make it strong and stable to lift your car. Due to the safety compact design,jack will automatically stop working when it reaches the height limitation. 【Efficient】With 3Tons large load capacity,it can lift the car/SUV in less than a minute,12.5cm to 36cm lifting height for car and 17 to 42cm lifting height for SUV.Remove the screws by the electric wrench included in the package,change a tire quickly,perfect tire jack. 【Easy to Use】You can plug it into car 12 volt power outlet or on your battery directly,push the controller button with long enough line,and the car/SUV goes up, just that simple. 【Universal】The jack is equiped with Car and SUV Jack Head,unversal for lifting car or suv.One jack to solve all your problems. 【Much Accessories and Well Packed】Comes with controller, crank handle, impact wrench, screwdriver, fuses, a pair of gloves, etc for much convenience.Packaged in plastic storage case for easy transportation and storage. Compact size equipment stores in car for emergent roadside tire change and repair.